This book focuses on forward lease sukuk, which is one of the most viable and dynamic Shari?ah-compliant instruments in the Islamic capital market. The idea of forward lease sukuk is to raise funds from non-existent assets whose subject matter does not exist at the time of the sukuk issuance. 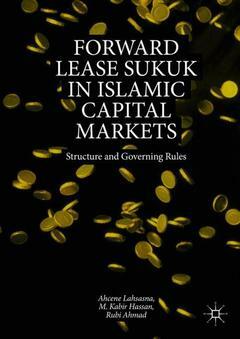 This book discusses the significant features of forward lease sukuk and demonstrates its vital contribution to project construction and manufacturing within the expanding field of Islamic finance. Chapter 1. Introduction to Sukuk.- Chapter 2. An Overview of Islamic Capital Market (ICM) and Sukuk Industry.- Chapter 3. Sukuk in Islamic Capital Market.- Chapter 4. Types of Sukuk, Their Classification and Structure in Islamic Capital Market.- Chapter 5. Theory of Ijarah, Securitization and the Concept Financial Certificate.- Chapter 6. Forward Ijarah Sukuk: Concept, Issuance, Structuring and General Governing Rules.- Chapter 7. Major Principles, Terms and Conditions Governing Ijarah Sukuk Issuance as Practiced in the Islamic Capital Market.- Chapter 8. Forward Lease / Ijarah Sukuk: Issues, Challenges and Shariah Compliance.- Chapter 9. Sukuk Ijarah & Forward Lease Sukuk—Case Study.- Chapter 10. Conclusion, Recommendation and Policy Implication.- Appendix A. Securities Commission Malaysia Guidelines on Sukuk.- Appendix B. IFSB Requirements on Sukuk Issuance.- Appendix C. DFM Standard for Issuing, Acquiring and Tradin Sukuk.- Appendix D. Glossary. Ahcene Lahsasna is currently Vice President of Research & Publication at the Malaysian Financial Planning Council (MFPC) and Academic Director of the Singapore Islamic Finance Academy (SIFA). Previously, he was an Associate Professor at the International Centre for Education in Islamic Finance (INCEIF) Malaysia, also known as the Global University of Islamic Finance. Professor Lahsasna is a registered Shariah Advisor at Bank Negara Malaysia and Securities Commission Malaysia. He acts as a Shariah Advisor for Islamic banking, Islamic capital market, Takaful, and Re-Takaful locally and internationally. M. Kabir Hassan is Professor of Finance in the Department of Economics and Finance at the University of New Orleans, USA where he currently holds two endowed Chairs—Hibernia Professor of Economics and Finance and Bank One Professor in Business. Professor Hassan is the winner of the 2016 Islamic Development Bank (IDB) Prize in Islamic Banking and Finance. He received his B.A. in Economics and Mathematics from Gustavus Adolphus College, Minnesota, USA, and his M.A. in Economics and Ph.D. in Finance from the University of Nebraska-Lincoln, USA. Rubi Ahmad is an Associate Professor of Finance and Banking and current Deputy Dean of Research and Development in the Faculty of Business and Accountancy (FBA) at the University of Malaya, Kuala Lumpur, Malaysia. She holds a Ph.D. in finance from the Department of Accounting and Finance at Monash University, Melbourne, Australia and an MBA with a specialization in finance from the University of Memphis, Tennessee, USA. Addresses the topic of forward lease sukuk as core object, providing a single reference with regard to lease and forward lease sukuk (the first book in the market to do this).